For rackmount equipment applications, we use a welded aluminum rack chassis with standard EIA rack hole spacing (1.750" height) for rackmount equipment installation, and then mount the aluminum rack frame into our welded aluminum rackmount cases using neoprene or metal coil isolators for protection against shock and vibration during shipping. 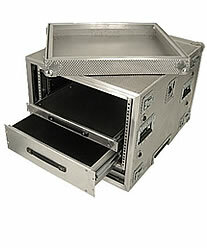 Typically provided with front and back removable covers, this rackmount case design allows easy access to equipment rear panels for cabling connections, and access to the front for operation, reducing your setup time once you arrive on site. Durable yet lightweight, our welded rigidized aluminum rack mount cases are available with standard 19" rack width, from 3 to 30 EIA rack spaces high with rack depths from 16" to 36". Need a non-standard rackmount case solution? Whether you require a standard or non-standard rack mount case, shock isolated or hard mounted EIA rack rails, simply tell us what you need in the form provided below, and we'll provide a quotation for a rigidized aluminum rack mount case that meets your specific requirements. As with all our rackmount case designs, there are no set-up fees, our minimum order is one, and typical lead time to shipping is 10 business days from order. View a selection of custom rackmount cases in our photo gallery.